Today we launched SUSE Studio as part of Novell's SUSE Appliance Program. This is an exciting event, as it marks a major milestone for the work we did in the Studio team for the last two years. 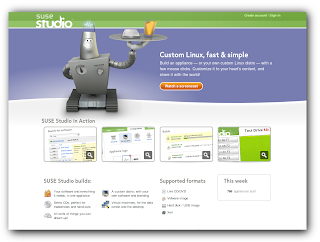 With SUSE Studio you can build your own Linux, fast and easy. You only need a web browser. To achieve this, a lot of code was written, a lot of feedback from users was collected, and a lot of work was done to deliver a great user experience. At Linuxtag 2008 we presented Studio to the public for the first time, followed by an Alpha and a Beta period where we invited more and more users. We talked at FOSDEM and Linuxtag 2009 about Studio and presented the Studio Kiosk at various trade shows. All this comes together now in the launch of SUSE Studio as part of the SUSE appliance program. If you would like to give it a try yourself, sign up at susestudio.com, and we'll send you an invitation. The major features of Studio, such as building appliances and testing them in the web browser, are pretty well known now, not least thanks to an amazing community, which has created walkthroughs, screencasts, reviews, and tutorials. But there are also some lesser known features, for example the API, testdrive networking, public download URLs, or the MySQL configuration. I'll try to find some time to write a bit more about these features later. For my personal work Studio has become an important tool. I used it for example to create the Marble Live CD, or for my hackweek project, the KDE SDK. It's also a nice way to try out software or create an updated openSUSE version, for example with the latest KDE. But many other people are using Studio for interesting projects as well. Some of these are collected on the SUSE Studio appliances page in the openSUSE Wiki. If you have created something with Studio, please don't hesitate to add your project there. One of the most interesting aspects of working on SUSE Studio is the technology side of things. It's a complex and demanding system, so it was an exciting challenge to actually build it. When we started as the SUSE incubation team, our mission was to explore new technology and foster innovation, and we learned a lot while applying this mission to the work on Studio. As a base we use Kiwi, the SUSE command line imaging tool, and we basically put it on Rails, with the web interface you can see on susestudio.com written in Ruby on Rails. Rails is a fantastic framework for doing web applications, and we use it not only for the UI itself, but also for internal HTTP APIs. 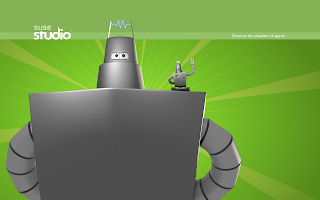 SUSE Studio even made it to the list of amazing applications on the Rails web site. Another area where we learned a lot is deployment. It took us a while to find the right combination of procedures based on git, Webistrano, and system administration tools. But now we have a three-layered weekly release process, which works pretty well, and enables us to get fixes out to our users in a quick and reliable way. 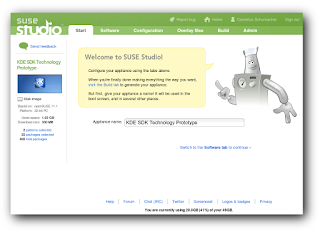 All that said, from my personal point of view the best feature of SUSE Studio is the team which created it. It's an honor and a pleasure for me to work with people who bring together such an enormous amount of talent, experience, and passion. I really enjoyed the last two years, and I'm looking forward to a lot of other great stuff coming from this team. Guys, you rock. I use SUSE Studio. Nice job. Thanks! Not everything has to be open sourced... at least, not immediately! Where can I download the source code for the Ruby on Rails app? Thanks to all for the nice words. @mether: At the moment we provide Studio only as a hosted service, so the code is not released. I'm a SUSE Studio user, and I have enjoyed being a part of the alpha and beta processes. It is exciting to hear that you've officially released the service! The developers have been available and prompt when responding to feedback. That has been much appreciated. One quick question: Do you foresee adding the ability to verify MD5 checksums of created appliances soon? I would assume that it would add a certain measure of reassurance to ISVs to verify their downloaded appliances checksums before deployment. @zoot: Glad that you like Studio. We do plan to show the MD5 sums of created appliances next to the download link, so that it's possible to verify integrity of the downloaded files. I'm a longtime SUSE user in addition to Windows (3.1 thru Vista & Server 2008), Solaris, HP/UX, OS/2 and SCO. I'm not familiar with the Suse Studio product or it's uses. Can someone break down for me the purpose of this product and some ideas of what you can do with this product that you can't do otherwise? I'm really trying to understand the use of Studio and thought those using it could help me to understand. Thanks to anyone who can provide some enlightenment. It is just after the fact, so much time, but ... following the last poster link I am getting to some Bebo ... site and I rest my case! Reading again the post I am wondering if we will have any chance in the future to escape this "experts" from the field, certificated with multiple choice exams. @shauncwog: have you opened and read the pages on the suse studio site? if yes, and still do no get the point, it proves that you "used" so many operating systems without anything going above. Do not waste our time by posting this stupid questions!